•	Utilization of a post-tension slab to further mitigate the differential EQ-induced settlement impacts on the superstructure. The combination of a post-tension slab over a reinforced soil mat to mitigate EQ-induced differential settlements utilized US expertise and past performance data from the 2011 Christchurch Earthquake in New Zealand and, to our knowledge, was applied for the first time in Orange County. •	Providing significant cost savings as compared to other more standard mitigation methods. Innovative design engineering and construction of the reinforced-compacted soil mat eliminated the use of crushed rock and heavy equipment typically needed for installation of liquefaction mitigations such as stone columns or ram aggregate piers. The proposed mitigations resulted in simpler construction and smaller carbon footprint. A unique and innovative solution which had performed well under lightly loaded structures during the 2011 Christchurch Earthquake(s) was enhanced and combined with a post-tension slab to provide mitigation redundancy against EQ-induced differential settlements. The mat/post-tension slab over a reinforced compacted soil or gravel mat may serve as a model for supporting lightly loaded structures over potentially liquefiable soils. The reinforced mat is expected to redistribute the potential differential settlement and reduce the induced moment on the slab. In addition, the mat and/or post-tension slab provides an integrated foundation system that performs in conjunction with the superstructure and has the flexibility of re-leveling should measurable tilting occur. The proposed foundation system was designed in collaboration with the Project Geotechnical and Engineer and the Project Structural Engineer. Combination of the post-tension slab over a reinforced soil mat to mitigate the EQ-induced differential settlements was applied for the first time in Orange County. The City of Dana Point reviewed and approved the proposed foundation system. As a part of the development of the South Cove Community within the City of Dana Point, GMU collaborated with Borm, the Project Structural Engineer and the City of Dana Point to design a hybrid post-tension slab over a geogrid-encapsulated reinforced soil mat and a permeable rock layer to protect lightly loaded residential units against EQ-induced settlements due to liquefaction of subsurface soils. 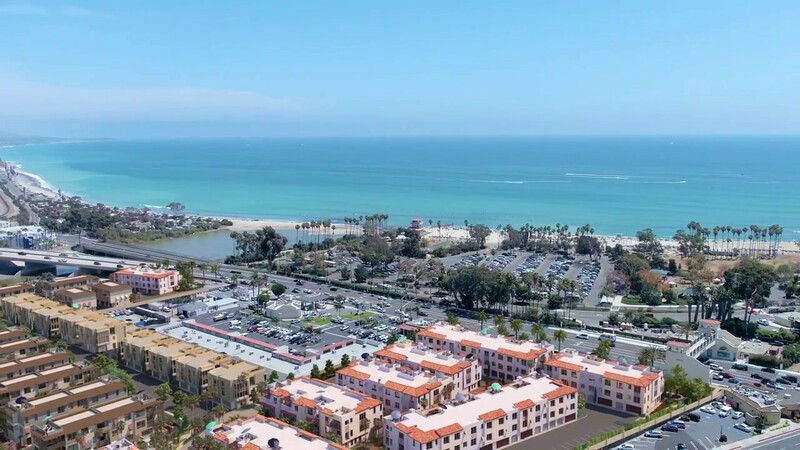 South Cove Development is located in one of the most desirable areas of California with easy access to Doheny Beach and Dana Point Harbor. Due to its close proximity to the beach and San Juan Creek, the site is underlain by granular alluvial deposits susceptible to liquefaction. Lessons learned from the performance of gravel mats under lightly loaded foundations during the 2011 Christchurch Earthquake combined with our local expertise resulted in an enhanced design with added redundancy to protect lightly loaded structures against EQ-induced differential settlements. The proposed system may be applied by local contractors and does not require specialty subcontractors. Challenges of this system included: 1) the depth limitation of the soil reinforcement elements which were restricted by the depth of the groundwater table at the site, and 2) installation of the utilities that, in some cases, had to go through the soil reinforcements. The proposed system is expected to exceed the criteria contained in the applicable California Building Code requirements.